Kendall Room - InBalance Meetings. Room includes breakout pod, mini bar, fir ball, yoga mats and magnetic whiteboard. We offer clients an unparalleled standard of personal service in contemporary and stylish surroundings. Located in the heart of Brisbane, Novotel Brisbane is the perfect venue for conferencing, meetings, and special events. Novotel Brisbane's conference facilities consist of ten separate venues and can facilitate conferencing for up to 350 delegates. Each of the different conference venues have ISDN lines, most feature natural light and video conferencing capabilities with spacious pre-function areas. In addition, all of our rooms have the added convenience of broadband and wireless Internet (cost applies). Novotel Brisbane is a short walk from Central Railway Station and the Queen Street Mall, providing easy access to a great range of shopping and dining experiences. Novotel Brisbane is a contemporary, 4 ½ star hotel in the heart of Australia's sunniest capital city, Brisbane. It is one of Queensland's most popular and stylish hotels having completed a full refurbishment mid 2011. The 296 well appointed rooms and suites are spacious and complimented by superb views over the city. The hotel features two restaurants, bars, sun deck, pool, sauna, gymnasium, business centre, meeting facilities and undercover parking. Novotel Brisbane is renowned for its superior quality and comfort and is perfect for business or pleasure. 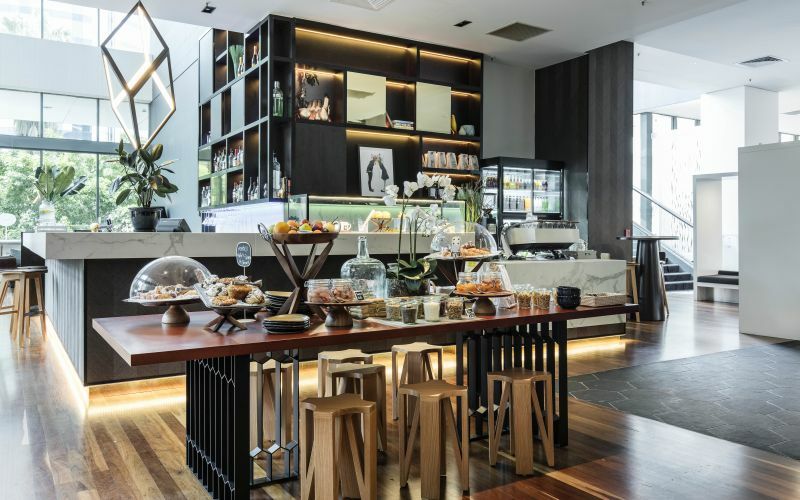 The Restaurant located on the ground floor of Novotel Brisbane offers breakfast from 6.00am through till 10.00am catering for both in house guests and the public offering a mouth watering buffet breakfast with a healthy twist. The Restaurant and Bar have both indoor and outdoor dining options for lunch and dinner and are a favourite with conference delegates for that much needed and well deserved break. The well equipped hotel gym, sauna, and outdoor pool are all located on level 2 of the hotel. The Business Centre or iMac station is located on the ground floor of the hotel, near reception. The computers are complimentary for all in house guests and conference delegates as is the internet access they provide. platform to achieve great meeting outcomes. Novotel Brisbane has unveiled the River City's newest urban dining and wining space with the launch of its GourmetBar.